Daniel Lincke studied Computer Science at the Friedrich-Schille-University Jena and graduated in 2003 (Diploma). After working two years in an industrial researched company he became a PhD student at PIK in 2006. 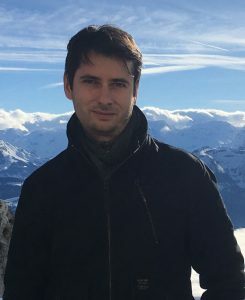 After finishing his PhD (supervised at the Technical University Hamburg-Harburg) in 2012 he joined GCF as a scientific programmer, where his strong knowledge of different programming paradigms and languages is used in different projects. Currently he is involved in the Adaptation and Social Learning process, where he is responsible for application and further development of the DIVA model. From October 2015 – March 2016 he was visiting scientist at State Key Laboratory of Earth Surface Processes and Resource Ecology (Beijing Normal University), where he was working on an application of DIVA for the entire coast of China. In 2017 he worked for 10 months with the Cluster of Excellence “The Future Ocean” at Christian-Albrechts-Universität zu Kiel (CAU). Lincke D., S. Schupp, and C. Ionescu (2015). Functional prototypes for generic C++ libraries: a transformational approach based on higher-order, typed signatures. International Journal on Software Tools for Technology Transfer 17 (1), p. 91-105. DOI: 10.1007/s10009-014-0299-0. Hinkel, J., D. Lincke, A. T. Vafeidis, M. Perrette, R. J. Nicholls, R. S. J. Tol, B. Marzeion, X. Fettweis, C. Ionescu, and A. Levermann (2014). Coastal flood damage and adaptation cost under 21st century sea-level rise. Proceedings of the National Academy of Sciences 111 (9), p. 3292–3297. DOI: 10.1073/pnas.1222469111 1222469111. Wolf S., S. Fuerst, A. Mandel, W. Lass, D. Lincke, F. Pablo-Marti, and C. Jaeger (2013). A multi-agent model of several economic regions, Environmental Modelling and Software 44 p. 25-43. Lincke D. (2012). A transformational approach to generic software development based on higher-order, typed functional signatures. PhD Thesis, Technische Universität Hamburg-Harburg, 2012. Wolf, S., S. Fürst, A. Mandel, S. Knell, W. Lass, D. Lincke, J. Teitge, and C. Jaeger (2012). Two modes of scheduling in a simple economic agent-based model. SIMULTECH 2012 – Proceedings of the 2nd International Conference on Simulation and Modeling Methodologies, Technologies and Applications, Rome, Italy, 28 – 31 July, 2012. Lincke D. and S. Schupp (2012). From HOT to COOL Transforming Higher-Order Typed Languages to Concept-Constrained Object-Oriented Languages. In: A. Sloane and S. Andova (Ed. ), Proceedings of the12th Workshop on Language Descriptions, Tools and Applications, LDTA 2012, Tallinn, Estonia, March 31 – April 1, 2012. Botta, N., A. Mandel, C. Ionescu, M. Hofmann, D. Lincke, S. Schupp and C. Jaeger (2011). A functional framework for agent-based models of exchange. Applied Mathematics and Computation 218, 8, p. 4025-4040. Lincke D. and S. Schupp (2009). The Function Concept in C++ – An Empirical Study. In: J. Gibbons, R. Paterson (Ed. ), WGP’09: Proceedings of the 2009 ACM SIGPLAN workshop on Generic programming, Edinburgh, UK, August 30, 2009. Lincke D., P. Jansson, M. Zalewski and C. Ionescu (2008). Generic Libraries in C++ with Concepts from High-Level Domain Descriptions in Haskell. A Domain-Specific Library for Computational Vulnerability Assessment. In: Taha, Walid Mohamed (Ed. ), Domain-Specific Languages, Proceedings of the IFIP TC 2 Working Conference, DSL 2009, Oxford, UK, July 15-17 2009.